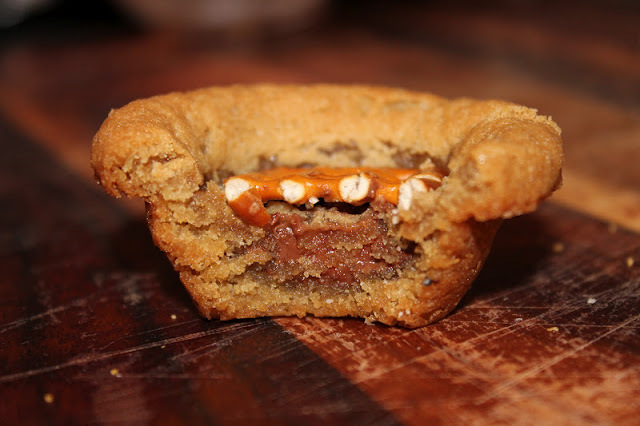 Pretzel Rolo Cookie Cups – Chocolate caramel candies baked in a brown sugar cookie shell and topped with a pretzel. This week’s post comes from, you guessed it, another request from work. I love making things that people suggest. Plus, it opens me up to recipes that I probably wouldn’t have made otherwise. This recipe was found by one of my co-workers on Pintrest. 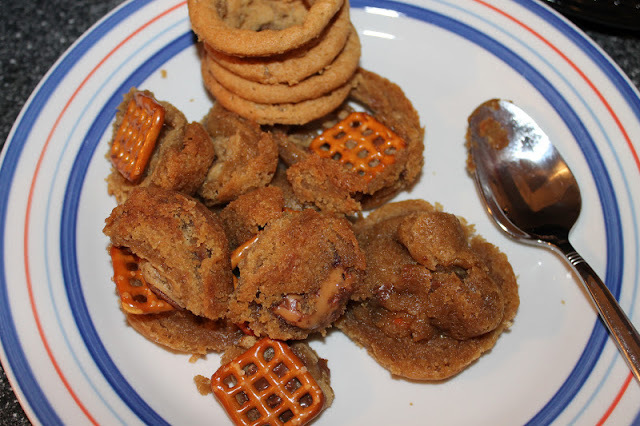 The pretzels on top threw me off a bit so I don’t think I would have tried this recipe had she not suggested it. And man, would that have been a huge mistake! The pretzels add just the right amount of saltiness, giving these little bites the perfect balance of sweet and savory. And who doesn’t love that. This recipe is super easy to follow. 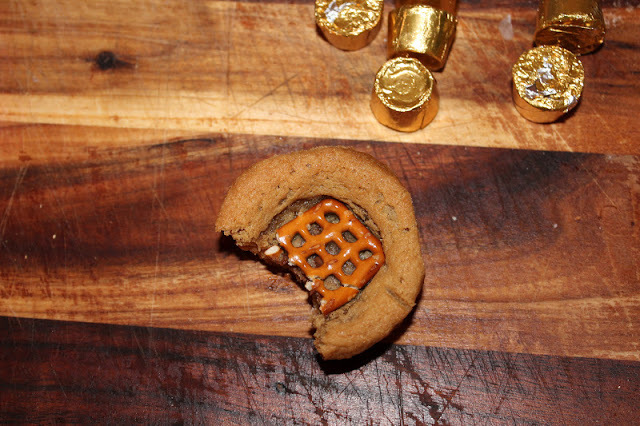 All you do is make a simple blondie mix, stick a Rolo in the middle, and then top with a pretzel. That’s it! They’re perfect for sharing or parties, since the recipe makes about 40-50 cups. Check out the recipe below. Preheat oven to 350. Spray a mini muffin pan with non-stick spray (I may have over-done it a bit, as you can see below). With mixer on medium cream butter and sugars together, mixing until incorporated evenly. Add eggs and vanilla, beating until combined, about 30 seconds. Turn mixer speed to low. Add in your baking soda, salt and flour. Mix until just combined. Spoon by rounded tablespoon into prepared pan (I used my cookie scooper. Seriously, the best gadget I’ve ever bought). Gently press a Rolo into the center of each batter-filled cup. Bake for 10-12 minutes or until the edges are golden brown. As soon as they come out of the oven press a pretzel directly on top of the blondie bite into the melted chocolate of the Rolo. Remove from pan, let cool on a wire rack. This was A LOT trickier than I ever imagined. I broke at least 12 cups trying to get them out (see picture below). To prevent this from happening to you, too, I recommend you letting these babies cool overnight or for a long period of time (refrigerate them if you want to). Don’t take chances! Learn from my mistake. My mess of broken cups. A spoon actually helps them come out, btw. I have saved this recipe because these look amazing! I need to make these! Wow…those look amazing. I love the sweet/salty combos, I might have to try this one.